Create a stunning natural aquascape with our aquarium Wood Stone. 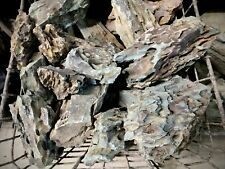 12x New NATURAL Flat SLATE Rock Gravel Pieces AQUARIUM or VIVARIUM Decoration. Corner SLATE Cave Stone Rock for Bristlenose Pleco AQUARIUM Fish Tank Vivarium. !!! Buy 2 Get 1 Free !!! 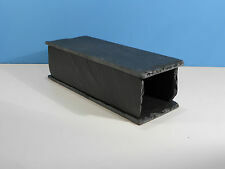 New PLECO Slate Rock Spawning Cave Ornament shelter hide for Aquarium Fish Tank. Natural SLATE Cave Stone Rock for Bristlenose Pleco AQUARIUM Fish Tank Vivarium. Corner SLATE Cave Stone Rock for Bristlenose Pleco AQUARIUM Fish Tank Vivarium. As well as serving as a beautiful decoration for your aquarium this slate cave will also provide cover for shy or nocturnal species of fish or invertebrates. Ocean Rock is a natural alkaline rock suitable for Saltwater Marine, African Rift Valley Hardwater Malawi/Tanganyikan cichlids, Intertidal brackish and coldwater due to its excellent buffering capacity. 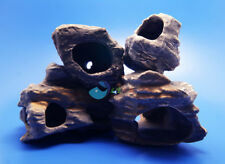 They can be used with other rocks or slate to make ledges and crevices ideal to provide shelter for small fish and fry. New NATURAL Flat SLATE Rock Piece AQUARIUM Fish Tank Gravel Reptile Basking Tile. The rock will also algae up and hold beneficial bacteria and would need to be routinely cleaned and replenished. 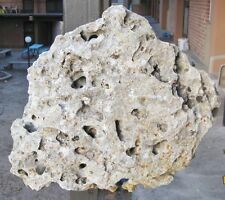 TUFA ROCK (5KG ). 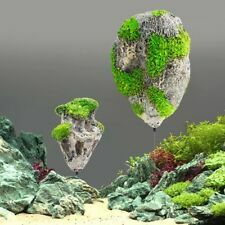 Tufa rock's structure is composed of calcified organic material, including twigs, leaves, mosses and shells creating a detailed and intricate decor for aquarium. Aquarium Coral Reef Rock Imitation Coral Reef Moss Decor Marine Cichlid Description AK779 Artificial Moss Coral Reef Rock AQUARIUM RESIN REPLICA DETAILED FISH TANK ORNAMENT - Ornament is made from non-toxic plastic ma terial and makes an exciting ornament in any aquarium. - Offers the natural environment feeling. - Change your aquarium into a beautiful scenery . 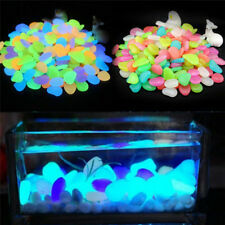 - It is vividly and color detailed to add lively and natural life to your tank. - It is great to decorate your aquarium all the time with minimum responsibility and maintenance. - They're are absolutely safe for fish and best of all, they won't die, rot or cause any algae problems. Measures approximately: 6.29" X 3.34" X 3.54" (16X 8.5 X 9cm) (L x W x H ) Weight:348g. 2KG SLATE Rock Stone for Aquarium Fish Tank Decoration. Thick Chunky Pieces. They can be used with other rocks or slate to make ledges and crevices ideal to provide shelter for small fish and fry. 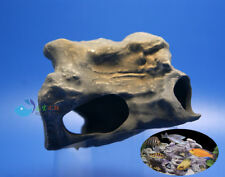 12x New NATURAL Flat SLATE Rock Gravel Pieces AQUARIUM or VIVARIUM Decoration. Thick chunky slate pieces. 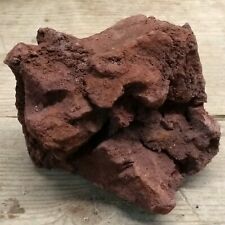 Can be used with other rocks or slate to make ledges and crevices ideal to provide shelter for small fish and fry. Aquarium grade slate sourced direct from quarry. Inert and fully safe for aquarium use. 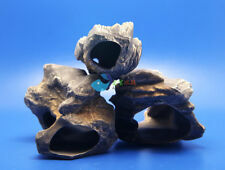 Approximately 7KG OCEAN ROCK MARINE REEF MALAWI 10 PIECES FISH AQUARIUM CORAL ASSORTED SIZED. Condition is used in my Malawi tank. Dispatched with Royal Mail 1st Class. The bottle has been used for size comparison only and is not included in the sale. The rocks provide perfect cover for small fish as they are full of holes. There is one piece which is slightly green due to algae in my tank which the malawi mbunas eat. The holes make them quite light in weight hence reducing the risk of your glass tank cracking! Prior inspection is welcome. Collection is very welcome to save on the postage. Please also see my other items too! LAVA ROCK (3KG). Porous nature allows mosses and plants to flourish. Ideal for Malawi and Tanganyikan aquariums. Lightweight so displaces less water in your aquarium. Lots 4 pcs MF CICHLID STONE Ceramic Aquarium Rock Cave decor for Fish Tank AK673 Description 1 SET of 4 ROCK F923 A X1 F923 B X1 F923 D X1 F923 E X1 Measures approximately for these 4 type of stones: A 5.3" X 3.5"X2.6" (13.5X 9X 6.8cm) (L x W x H ) B 4.4" X 3.6"X2.8" (11.2X 9.2X 7.1cm) (L x W x H ) D 3.1" X 3"X2.1" (8.1X 7.6X 5.4cm) (L x W x H ) E 3.5" X 2"X1.9" (9X 5.2X 5cm) (L x W x H ) Ceramic Replicas are great homes for live bearing tropical fish, most notably South American and African Cichlids. Spacious interiors encourage exploration while providing secure breeding niches and a defensible, stress-reducing refuge. Can be used with other rocks or slate to make ledges and crevices ideal to provide shelter for small fish and fry. 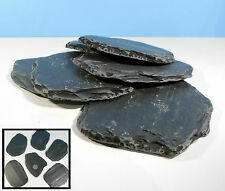 12x New NATURAL Flat SLATE Rock Gravel Pieces AQUARIUM or VIVARIUM Decoration. Aquarium grade slate sourced direct from quarry. 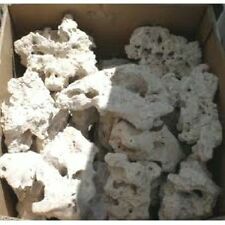 They can be used with other rocks or slate to make ledges and crevices ideal to provide shelter for small fish and fry. Corner SLATE Cave Stone Rock for Bristlenose Pleco AQUARIUM Fish Tank Vivarium. Lots 3 pcs MF CICHLID STONE Ceramic Aquarium Rock Cave decor for Fish Tank AK675 Description 1 SET of 3 ROCK F923 A X1 F923 C X1 F923 E X1 Measures approximately for these 3 type of stones: A 5.3" X 3.5"X2.6" (13.5X 9X 6.8cm) (L x W x H ) C 4.0" X 3.4"X3.1" (10X 8.5X 7.8cm) (L x W x H ) E 3.5" X 2"X1.9" (9X 5.2X 5cm) (L x W x H ) Ceramic Replicas are great homes for live bearing tropical fish, most notably South American and African Cichlids. Spacious interiors encourage exploration while providing secure breeding niches and a defensible, stress-reducing refuge. Description Eco-Friendly Ceramic Replicas are great homes for live bearing tropical fish, most notably South American and African Cichlids. Spacious interiors encourage exploration while providing secure breeding niches and a defensible, stress-reducing refuge. Ceramic stones provide a lightweight alternative to real stone in your aquarium. The hollow caves provides shelter, hiding spots, and spawning sites for your cichlids. Since they are hollow they do not displace or reduce the amount of water in your aquarium. Use small thread to bundle the moss on the product constitute a nature living environment. Specially made with ceramic material that possess filtration function for aquarium. Measures approximately: 4.6" X 3.3"X2.8" (11X 8.5X 7.3cm) (L x W x H ) Weight: 179g. This extra small size hand crafted real slate cave is a wonderful natural addition to any aquarium or vivarium. We chisel our own parts from the finest slate available and make them as big as possible in order keep the character of the stone. LAVA ROCK (5KG). Porous nature allows mosses and plants to flourish. Ideal for Malawi and Tanganyikan aquariums. Lightweight so displaces less water in your aquarium. Fresh Coldwater and Tropical. polyester resin with plastic plants does not affect the water quality . 8x 30cm height, 15m rolls. Boxes a bit dusty. 1x Aquarium Coral Reef Rock. Long soak in the fish tank, will not change its color. Put the rock under the fish tank directly. Use high-quality resin, through the high temperature casting mold, not only beautiful, but also image vividly. Rocks Terrapin Ramp, Approx. Size: L 15 cm, W 9 cm, H 5.5 cm. Vivarium decoration made of polyester resin, salt water resistant does not affect the water quality.1 x Rocks. If there's a problem, just let us know and we will fix it.